This is a deck that I made at the very beginning of Lost Lands and have been playing off and on and tweaking as I go. Currently I’m rated 346 with it in quick match, so it’s certainly competitive – in the right meta. This deck has gotten me great compliments like “lucky top-decker!” and “Tidal wave won that game, not you!” I like being the only one playing the deck, as it makes it less likely that people will know how to deal with it, or that the meta will adapt, but people have finally caught on and started copying me, so I figured I’d post it and let you all know how it works. As you can see the deck focuses on having a LOT of abilities. It’s got a small number of allies and loads of abilities. It looks like an unbalanced mess on paper. Set up draw! Without draw this deck is in trouble. Accordingly there are a lot of overlapping draw engines included in the deck. You want to make setting up at least one draw engine a top priority. Against someone who might carry tech, you’ll want to hold a draw engine in reserve as well. Ignoring my allies results in growing threats as I buff them, or reduced offensive capability from passives like Guardian of Unaxio and Live Together Die Alone. Attacking my allies results in a slower game, where we are both playing a control style. My deck gets stronger the longer the game goes…theirs probably doesn’t. The mega super scary ally. With Divine Connection and so many different ally attachments, any ally can be buffed to ridiculous proportions. 13/13 is not uncommon in the mid-late game for this deck. Especially with Generals of Unaxio pulling Arada Jewels. Incense. When I was 8, my sister bought some incense and we played with it as if it were cigarettes and we were smoking. I remember getting a horrible headache. Give your opponent a headache as you play one after another tiny little attachment. This sounds insignificant, but it is possible to win games with just incense damage, and without ever landing an attack on the opposing hero. This obviously can combine with win-con A. Mill. This is not my favorite way to win, but sometimes it’s necessary. You have divine connection, so you’ll have the same attachments over and over. You also have resurrection, s o you can reuse those allies. That means this 63 card deck can play like an 80+ card deck. Confluence of Fate – this is probably the most important card in this deck. You should always prioritize playing this to set up your draw as soon as possible. General of Unaxio – This turns a deck of a bunch of random attachments into a toolbox. It’s really the star that makes this deck competitive. Whereas attachment Zhanna was a thing in Shattered Fates – it was always an inconsistent kind of deck. No Longer! You will usually want to pull Confluence of Fate, Divine Connection, For Unaxio and Zail’s Hymn in the early game, to set up your draw and control the board. Later in the game, use this guy to pull Nowhere to hide against Moonstalker or A Legend Rises against attachment decks. There are some really interesting tactical plays you can do with General of Unaxio’s seek ability. The thing to remember is – your opponent can see what card you sought. This means that you can use that fact as a little head-game. In one game against Amber, I pulled A Legend Rises. After that, I didn’t actually play it for several turns, but the opponent knew I had it, which meant EVERY ally I played had to be disabled AND killed. That meant Amber wasn’t free to do what she does best and go for face. Guardian of Unaxio – kill my allies, PLEASE! This guy is awesome because he HAS to die. This means that he will almost always prevent some damage to your hero. Put a few attachments on him, and he’ll draw you some cards in the meantime as well. Forgiveness – You have to know how many of these are in your deck. When you have these in a deck, it changes how you resource cards in the beginning of the game. In this case, I have two copies of Forgiveness, which means my first two cards that I resource are usually cards that I think will be useful some time after turn 8 or so (or possibly earlier, if I start the game with a forgiveness in hand, and plan to play it turn 2). What this means is, on turn 3 is the first time I will usually resource a useless card like Nowhere to Hide. It also means that Resurrection in my opening hand is usually my second resource (unless I’m playing against Praxix – as I don’t want to depend on drawing two forgivenesses). Resurrection – This deck needs allies AND attachments to work well. When you’ve got your stuff set up in the middle of a game, don’t be afraid to play resurrection for a guaranteed couple of allies drawn. 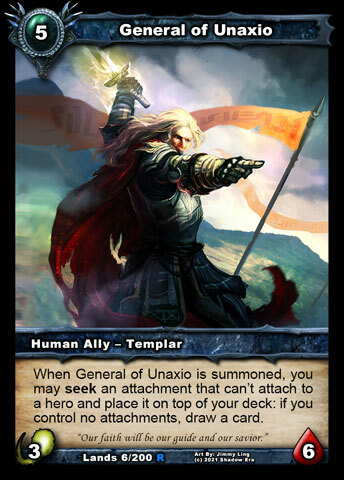 You’ll never get a lot of allies from this, since there aren’t that many in the deck, but you may just get back 2-3 Generals of unaxio and 2-3 guardians of unaxio. Remember all that damage they wasted killing your guardians? They get to do it again! Meanwhile, you can use your confluence of Fate + For Unaxio draw engine to keep the allies coming back into your hand. In longer games, or when playing against Mill decks, you need to be more careful with Resurrection – prioritize getting it and holding it in your hand until the very end of the game. It may buy you a few turns, or even turn the tables on the miller (Now the miller becomes the milled!). Sacred Fire Walker / A Legend Rises / Nowhere to Hide: These are all amazing in some matchups and mediocre to horrible in others. Just try to know where they’re good and be ready to use them in those matchups. Incense of Attonement – This is one of the win conditions. On the other hand, it can sometimes be a bad turn 2 play. Why? Because you shrink your hand for something that won’t do you any good for a while. The beginning of the game is about surviving and drawing cards. If playing incense of Attonement on turn 2 means empty hand on turn 5 (depending on your other cards), you may want to hold onto it or resource it, looking for that later forgiveness to get it back. Bad Santa – this is here as sort of a draw panic button. You don’t want to use it unless you need to, or unless you can do it without giving your opponent many cards. This is a control deck, so the fewer cards your opponent has, the better. If you’ve got loads of draw going, you may want to just go ahead and resource these…at other times, they are very important to get you out of a tight spot. You can also use them to bomb attachments onto one ally in the late game. In early versions of this deck, I used scriptures of the righteous instead of Bad Santa. It worked alright, but in some games, I found myself unable to do arcane damage, and so the scriptures had to go. I suppose Wizent’s Staff could work as well. Like all control decks this is strong against mid-range decks. 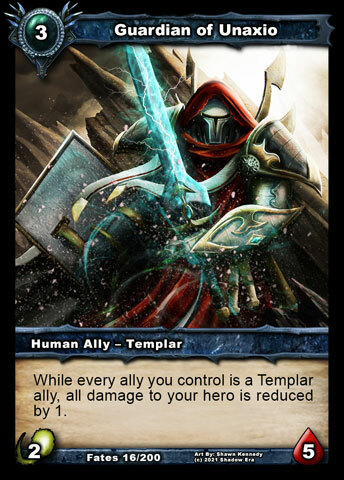 It is also on the slower side for control, which puts it on even footing, or better against other control decks. Because this is a slow deck, it does run into some trouble against very fast decks and some midrange decks. It also lacks certain types of tech. Because I was sticking to templars, I left out Sorceror of Endia. This means that some combo decks will just automatically win against this deck, and there’s little to nothing you can do. Some of that can be addressed by tweaking the deck, but I’m not sure I want to do that. Feel free to experiment with it though! Hope you guys enjoy this deck as much as I have!